HONG KONG, CHINA--(Marketwired - Nov 16, 2015) - Me-Mover, the developer of the step-driven fitness device that is taking the world by storm, today launched its latest innovation on Kickstarter: the Me-Mover FIT. This new generation of the stand-up exerciser on wheels aims to encourage urban fitness and promote healthy living in Asia. 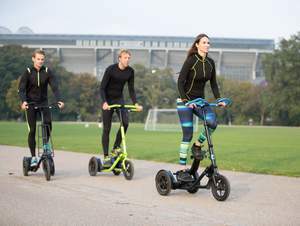 An innovative fitness device first introduced in Copenhagen in 2014, the Me-Mover allows people to ride in a natural, standing position, simply by stepping forwards. The company's first campaign received US$100,000 within four days on Kickstarter and ultimately raised triple that amount with 366 backers from around the world within a month. After delivering hundreds of Me-Movers to enthusiastic users globally, the company has now developed an entirely new generation based on the input and feedback from customers. The Danish team now aims to raise a further US$100,000 within the next month through the Me-Mover FIT Kickstarter campaign. The Me-Mover FIT gives people a new way to keep fit by taking the gym anywhere, making the whole city their playground. Taking just minutes to learn and fall in love with, the three-wheeled Me-Mover FIT is extremely stable and manoeuvrable, as well as compact and easy to transport and store, making it ideal for use in busy Asian cities. It delivers a high-intensity, low-impact workout that is suitable for all fitness levels. "There was an overwhelming response to our first project, with 25% of our orders coming from key Asian markets such as Japan, Korea, Hong Kong, Singapore and Taiwan," said Jonas Eliasson, architect, founder and CEO of Me-Mover. "We did an overhaul of the product and vastly improved both the Me-Mover FIT's technology and design based on our supporters' insights. We hope to reinvigorate the Asian fitness experience with our latest model which is tailored to those who want to add more fun and more fitness to their daily routine." The Me-Mover FIT features important technology enhancements, including a highly optimised and improved transmission with lower resistance and faster acceleration. The Me-Mover engineers have increased the range of the pedal stroke on the FIT, with a lower gear ratio at the top of the stroke and a higher gear ratio at the bottom. These new ergonomics offer the rider a vastly better driving feel. Design improvements include an adjustable handlebar with multiple grip options for optimal training position, an added bottle holder, cushioned foot straps for a more comfortable ride, and a carry strap for transporting the FIT when not in use. Me-Mover is creating a revolutionary fitness package with the introduction of two brand new add-ons. In addition to various improvements to the FIT, the team has also developed two add-ons to the device that lets users tailor their fitness experience. The new variable resistance trainer will allow users to set the exact effort level they want, by changing the Me-Mover FIT's rolling resistance. To enjoy a high-intensity workout at slower speeds, effectively simulating a hill climb, or just matching your speed with your training buddies. The simple home trainer add on, let users transform their Me-Mover into a stationary training device for great indoor exercise. With this comprehensive training package, users can easily use it indoors or out, simulate hill climbs, and work out in groups of various fitness levels. Since its launch in 2014, the Me-Mover has won fans worldwide as a fun and effective urban fitness machine. The ergonomic stepping motion used to power the Me-Mover activates six of the body's eight major muscle groups and particularly strengthens the core stabilizer muscles. While ideal for fitness enthusiasts and beginners, the Me-Mover has also proven to be a safe and effective rehabilitation solution for those recovering from injury or surgery. Tests confirm that Me-Moving is much gentler on joints and tendons than running and cycling. Users adopt a natural standing posture, which avoids neck and back strain. The Me-Mover FIT Kickstarter campaign begins today with a goal of US$100,000 and will run until December 16, 2015. Interested customers are invited to support the production of this new generation of the Me-Mover fitness device at the Kickstarter page. For more information, please visit me-mover.com and its social channels, Facebook, Twitter, YouTube and Instagram, for the latest updates. The Me-Mover FIT is the new generation of premium fitness device to accelerate the healthy living trend and enhance urban mobility in Asia.